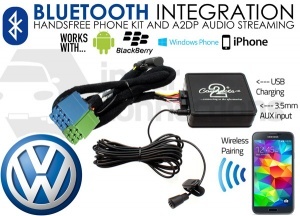 A Connects2 VW Bluetooth adapter will allow you to stream your mobile music directly to your original VW car radio via Bluetooth and receive hands free calls. Adapters are compatible with the Beta, Gamma, RCD200, RCD300, RCD500, RNS and MFD Navigation radios found in VW Golf, Polo, Lupo, Passat, Bora, Beetle, Eos, Jetta, Sharan, Transporter T4, Tiguan, Touareg, Touran etc. 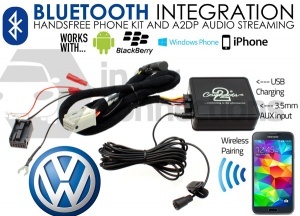 Enjoy bluetooth streaming of your music files and hands free mobile phone calls via your VW car stereo. Banish messy aux jack cables as your paired mobile device automatically connects to your VW radio via the adapter allowing you to listen to your mobile music and make/receive hands free calls. Works with Apple iPhone and iPad, Android, Windows Mobile, Sony, HTC, Blackberry etc. 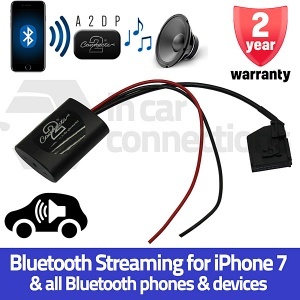 Connects2 VW Bluetooth adapter allows you to stream your mobile music directly to your original VW car radio via Bluetooth and receive hands free calls. For later models (2006 onwards). 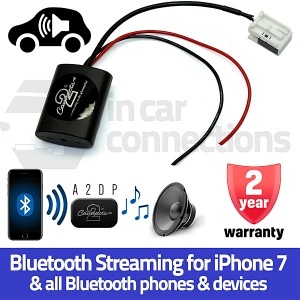 Connects2 VW Bluetooth adapter allows you to stream your mobile music directly to your original VW car radio via Bluetooth and receive hands free calls. For earlier models with Beta, Gamma, MFD1 or RNS MCD radios. VW Bluetooth streaming adapter allows you to stream your mobile music directly to your original VW car radio via Bluetooth. For MFD2 RNS RNS2 radios with AUX input. VW Bluetooth streaming adapter allows you to stream your mobile music directly to your original VW car radio via Bluetooth. For radios with AUX input.